Now you can relieve the pain and inflammation of the heel associated with plantar fasciitis. Our new FDA-approved laser has been proven in clinical tests to treat this painful condition effectively. The regenerative powers of this low-intensity laser technology can reduce inflammation and eliminate pain in the plantar fascia and return you to an active life after just a few weeks of treatment. The FX 635 promotes cellular regeneration through painless bio-stimulation. It provides patients experiencing chronic heel pain with a non-invasive, efficacious solution that can quickly improve their walking comfort and quality of life without surgery. While other lasers may claim to treat this problem in a quicker time frame, high-intensity lasers designed for treatment of other conditions may do more harm than good by burning out healthy cells. Don’t take chances with your feet! Only the FX 635 has been specifically recognized by the FDA as a safe and effective tool to treat plantar fasciitis. Plantar fasciitis is one of the most vexing chronic health conditions of modern American life. For many sufferers, it is a case of “damned if you do, damned if you don’t.” This disease is familiar to marathoners and other elite runners, for whom it can be a career killer; couch potatoes are equally prone to painful heel spurs, which may be greatly aggravated by obesity or prolonged periods of standing. While the number of serious new cases in the United States is only about a million each year, it has been estimated that as many as 10% of Americans will suffer moderate to severe plantar fasciitis over the course of their lifetimes. While the pain may moderate or even disappear without treatment, getting better is usually a slow process. It is not so easy to wait out the healing process, and it is important to know that healing never comes for some people. Many people affected by this condition find that even crossing the street can cause agony. Some people even dread getting out of bed in the morning, because the first few steps they take are usually extremely painful. Many people buy orthopedic clogs or other shoes that can cushion the pain. Dancing is out of the question most days. The good news is that the overwhelming majority of patients recover within a year, based on a regimen involving weight loss, less running or standing, and pain relievers such as steroid injections when heel pain is unbearable. Unfortunately, if the pain continues unabated, surgery, with all its attendant risks, may be recommended or even required to remove the heel spur. Low-level laser therapy (LLLT) is a powerful new non-surgical tool that can promote quicker and more complete healing of plantar fasciitis. 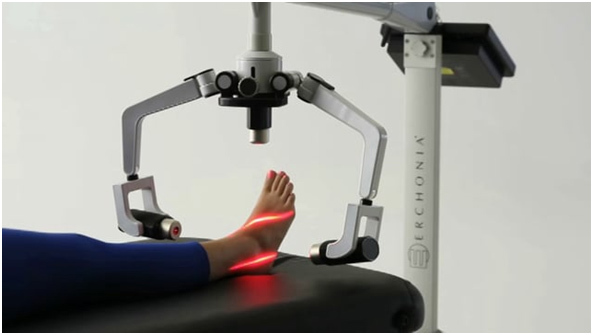 Rather than enduring a year or more of intense pain and foregoing your normal exercise routine in order to avoid aggravating your foot pain, Scarsdale-area patients now have the option of undergoing laser treatments a couple times a week. Many patients are free of both acute and chronic pain after less than a month of treatment! Even if LLLT is not the optimal treatment for your plantar fasciitis or heel spurs, Dr. Caruso has access to a wide range of other medical devices and methodologies to treat even very difficult cases in-office.